After you got the cable working, how did you upload the maps to your GPS unit? The gpsbabel program takes care of the uploading. 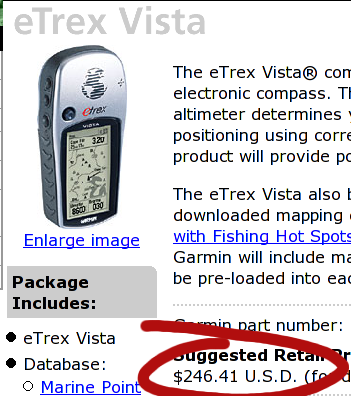 Just pass the parameters -r -i [format] -f [file] -o garmin -F [com port] and it uploads to the com port of your choice. I use /dev/ttyS1. The garmin just accepts the data no matter what mode it's in. Make sure to include the -r or nothing will happen. Nice bit of GPS hacking... I went with the standard eTrex handlebar mount since it was pretty cheap and well constructed. I thought about attaching the GPS with my own devices for about two minutes before I decided the real mounting device would be the best idea for me.